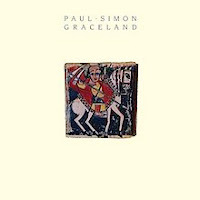 August marks the 25th anniversary of Rhymin' Simon's landmark solo album, Graceland. There's a strong possibility that there hasn't been a better album released since the record hit shelves. Paul Simon always had an ear for hooks and choruses, especially when paired with partner in crime Art Garfunkel. But Graceland stripped away his acoustic guitar, a crutch for some of his more underwhelming material and dropped him into the heart of South Africa. Opener "Boy in the Bubble" starts with a moody accordion solo, and while Simon strums his acoustic guitar, it gets lost between haunting synthesizers and constant rat-a-tatting of snare drums. "Graceland" opts for bluesy steel guitar riffs and background vocals from the Everly Brothers, but it's Simon whose softly-sung choruses and rambling verses absolutely soar. The African influences rollick through the record, sometimes subtle but mostly bombastic. "I Know What I Know" finds Simon duking it out with the Gaza Sisters, going note-for-note in a flamboyantly bouncy track. "Diamonds on the Soles of Her Shoes" doesn't shy away from its inspiration, going for gusto with an entire brass section and twinkling guitar riff that highlights the album. Although he cleverly crafts together Americana roots rock with tribal beats, Simon makes sure listeners understand that Graceland is a pop album through and through. Mainstream heavyweight "You Can Call Me Al" is layered with hook after quirky hook, and closer "All Around the World (The Myth of Fingerprints)" is as air-drumming worthy as it is a surefire karaoke standard. Sure, he's probably more remembered for sleepy acoustic standards "The Boxer" and "Mrs. Robinson" than his foray into a cappella territory on "Homeless" or his stab at bayou funk on "That Was Your Mother," but Paul Simon is as ambitious of an artist as he is prolific. Long removed from his tempestuous relationship with Garfunkel, few pop albums can hold a candle to the halcyon songwriting and lyrical witticisms of Simon's magnum opus, Graceland.